It seems every summer, from the middle of July to the end of August, there is a reported case of West Nile virus in Maryland. It is almost as predictable as the rising and setting of the sun. The timing of these infections is not purely coincidental and can be traced simply to the migratory patterns of birds in certain cases. It also has to do with the alarming number of birds that are vectors for the West Nile virus. Not all birds are considered vectors for transmission of the disease, but two well-known birds are (the Blue jay and hawks). A sign that birds are infected in your area, according to an article, is when you see crows flying as if they were drunk. They may take off 2 feet above the ground for a couple hundred yards then land again. Their wings droop in almost a drunken way, and they may flip over while landing. Unlike blue jays and hawks, crows are considered a “dead-end host”. This means they are not capable of passing West Nile any further. When you see signs that crows, whose once loud and robust caws could be heard without effort, now sound dim and weak you might be seeing the effects of West Nile. Where there are crows being infected, there are also blue jays and hawks to follow suit. According to Maryland’s Department of Mental Health and Hygiene, from July 1-October 31, 2013 there were 16 cases of West Nile virus instances found in humans. An additional 3 cases were found in animals from August to September, 2013. The surveillance report illustrated how important it is to rid areas of standing water. From July 16th through September 4th, 2013 there were 18 reported mosquito pools that tested positive for West Nile virus including one pool testing positive for both West Nile and Eastern Equine Encephalitis. 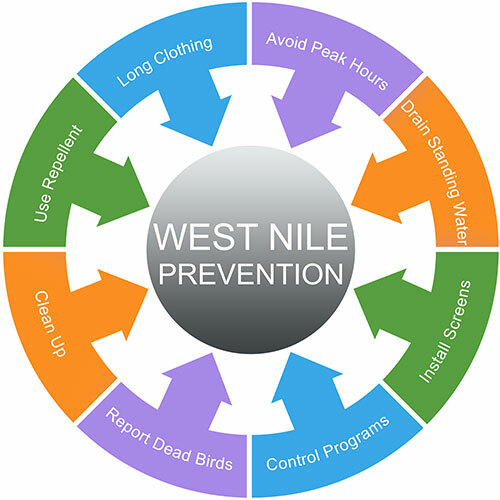 This goes to show the importance of adhering to Mosquito Squad’s “5 T’s” in order to keep your surrounding property safer with regards to mosquito breeding and facilitation of West Nile. In a previous blog post we referred to an article illustrating the capacity for mosquito-to-human transmission of West Nile virus. The article gave great insight as to how the potential for being infected with West Nile virus rose so dramatically, stating, “The West Nile virus can be transmitted by mosquito species other than the Asian Tiger. However, the all-day feeding habits of the Asian Tiger mosquito may increase the risk of spreading West Nile virus. The Maryland mosquito spraying program is not the best against the Asian Tiger mosquito. Spraying is usually done at sunset or after dark for native mosquitoes. Asian Tiger mosquitoes are virtually absent during these hours.” Mosquito Squad’s treatments use a different product than that used by the state and are more effective because we go into the backyards and spray areas where the state’s spray does not reach. The product Mosquito Squad uses has a residual affect that will kill mosquitoes that come onto the treated area, while still being people and pet friendly. This has resulted in much better control of the Asian Tiger mosquito in many yards around Frederick.